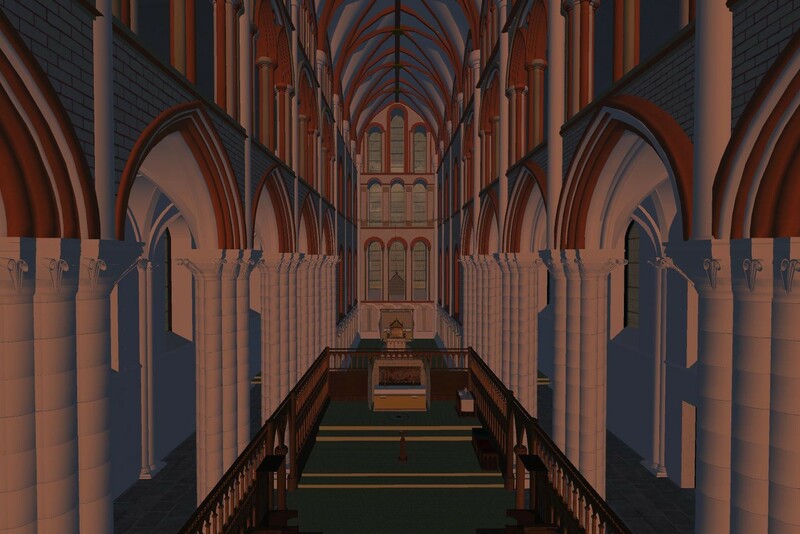 This is our 3D interactive reconstruction of how we believe the Cathedral may have looked in 1318, the year of its consecration, bringing the former grandeur of the building back to life, creating a better understanding of the layout, appearance and importance of this historic monument. Today the remains of the St Andrews Cathedral, overlooking the north sea at the edge of Fife only hint at a historic past. 700 years ago the building was one of the largest and most impressive religious buildings in Europe. The building of this once magnificent structure began in 1160. The construction of the cathedral did not run smoothly, as a short time after the nave was completed in 1270, the west end of the cathedral was blown down in a gale. It was then rebuilt in a slightly different position, further east. During his occupation in the Wars of Independence in 1296, Edward the I of England ordered the part built roof to be stripped of lead to make ammunition. The Cathedral was finally completed in 1318, when on the 5th of July it was consecrated in the presence of King Robert Bruce, who, according to legend rode up the aisle on his horse. Just 60 years later, in 1378 the cathedral choir and transepts were badly damaged by fire and they needed to be extensively rebuilt. In 1409 came another great storm and the collapse of the cathedral’s south transept. By 11th June 1559 during the reformation, the cathedral’s days were numbered, incited by the preaching of John Knox an attack was made on the Cathedral by a Protestant mob and the interior of the building destroyed. The Cathedral fell into decline following the attack and became a source of building material for the town and latterly a burial ground. This is a collaborative project within the University of St Andrews: The Open Virtual Worlds Team within the School of Computer Science and Professor Richard Fawcett from the School of Art History. With further contributing advice from Dr Sweetman and Dr Luxford from School of Classics and also Daryl Green, Rare Books Librarian from Special Collections.